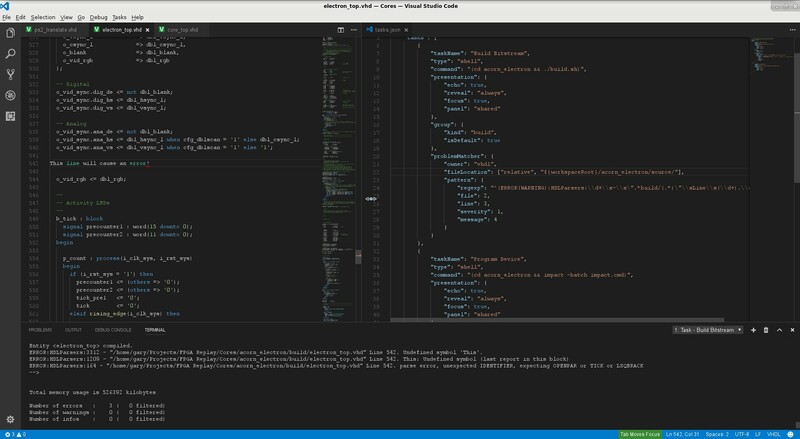 VSCode just gets better and better. I’ve been using it as my editor for the Acorn Electron replay core for a while now but always tabbed out to the terminal to run the build script and impact gui to program the FPGA. No longer! 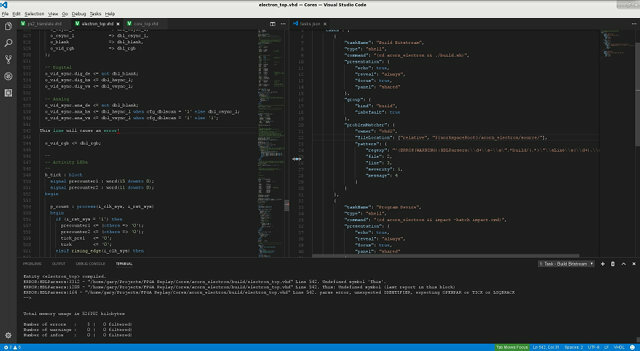 This can all be done now from within VSCode via ctrl+shift+b to build and ctrl+shift+p to program the FPGA. VSCode has a feature called “Tasks” which you can use to run arbitrary commands. 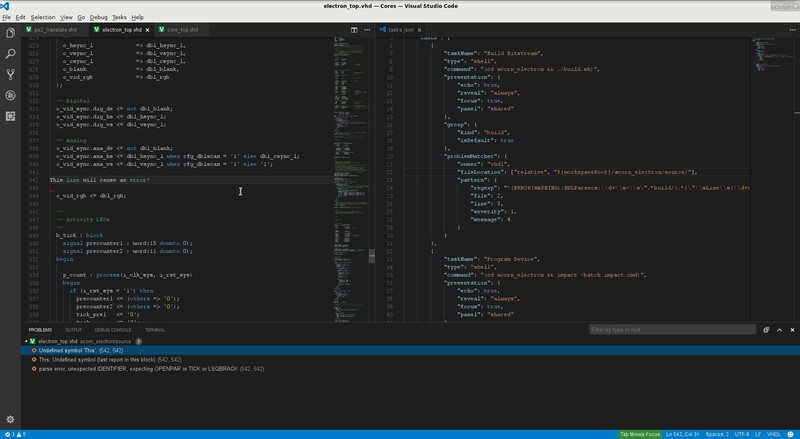 A tasks file can be created in your VSCode workspace via Tasks/Configure Tasks/Other. The following image shows the output of a failed build task (invoked by ctrl+shift+b) in the terminal tab. For reasons that are not really relevant to this post, I have my vscode workspace one directory above the acorn_electron core folder. The tasks file temporarily changes the working directory to acorn_electron before building, programming or finding source files to account for this. If the workspace is shifted to within the core directory the whole task can be made more generic and apply to any core. With the above tasks file in your workspace, ctrl+shift+b will switch to the acorn_electron directory and run the build.sh (refer to the Replay SVN repo for build.sh contents) which in turn runs each Xilinx command line tool to generate the core’s bitstream file. If the build succeeds, ctrl+shift+p will run the “Program Device” tasks which invokes the impact tool with a batch file to program the FPGA via the JTAG “Platform Cable USB”. If the build fails, ctrl+shift+m will bring up the problems tab where you can then click any error/warning and jump to the file/line as shown in the below image. There’s one quirk with how Replay cores build. All vhdl files have their hierarchy flattened and are copied into a build/ directory. The path the error refers to is thus to the build/ directory copy of the original source file and not the file you would want to edit. To account for this, the regular expression only captures the file name and not the full path to the file. Then the fileLocation entry makes the assumption that the file is in the source/ directory. Short of changing how the replay uses the build directory such that pathing information is retained, this seems hard to avoid and an acceptable compromise. Note, this only catches compile errors. It will not display Xst errors/warnings such as signals with multiple drivers. ctrl+shift+b already exists as long as you set the “Build Bitstream” task as your default build task. addDevice -p 1 -file "build/acorn_electron.bit"